Sgt. Richard Campbell (Bill Murray) and Pvt. Preston Savitz (Bob Balaban), academics more than G.I.’s, find themselves in a nighttime Mexican standoff with a German soldier. But, you will notice straight away the lack of tension, the absence of expectant music on the soundtrack. Instead it is all a bit leisurely – so leisurely, in fact, that Campbell decides the best course of action is to sit down. So he does, and Savitz and the German soldier follow suit. Campbell offers them each a cigarette. They all light up. No one pulls the trigger. They all walk away clean. This is “The Monuments Men” in capsule – it may be set in the midst of the European Theatre of WWII, but it all it really wants to do is sit down and have a smoke. This does not have to be bad thing. In fact, it can a very good thing, a great thing even, if the film commits to that tenor and the director at the helm provides a light touch. 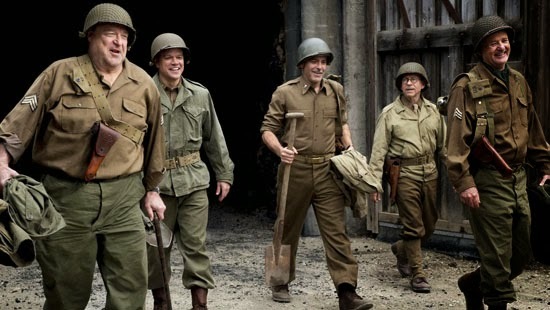 “The Monuments Men”, however, is something of a casual disaster, a tonal meltdown, a film that transposes Bill Murray eating homemade jerky with plaintive shots of concentration camps, a sometimes jaunty “Knute Rockne All American”-esque music score with a swelling, uber-patriotic “Saving Private Ryan”-esque music score, and with no earthly idea how to blend the two. The film’s based-on-a-true-story idea is compelling. As the war rages, it becomes evident that Hitler is stealing and stashing every valuable piece of art on the continent in the hopes of curating a museum in his own honor. Alas, if the Nazis are to lose, and it’s headed that way, he has given the order that all the art is to be destroyed. Enter historian Frank Stokes (Clooney), introduced by lecturing President Roosevelt on the finer points of art, which is apropos because Clooney spends much of the film lecturing via voiceover in regards to its overriding theme. I half-wonder if voiceover was added in editing when it was realized how little of the film’s Art-Is-Worth-Saving motif was conveyed through traditional cinematic channels of character interaction and dramatic confrontation. The editing, in fact, often resorts to dissolves, which could suggest an old-fashioned spirit, but could also suggest editors scrambling to get the hell outta moments that weren’t working. The cinematography, art direction and production design here are all peerless. Filmed on location in Europe, the settings appear authentic, our intrepid Monuments Men often standing before towering piles of rubble. Yet, I wonder if this film would have been better to forgo the piles of rubble, and shoot for more of an old world Hollywood back lot feel. That would have lessened the historical authenticity, but might have upped the energy. Nevertheless, when she grants her trust, she invites Granger for a “formal” dinner. He shows up dressed rather informally. So she brings out a tie and makes him put it on. Formal, informal, either/or, who knows? 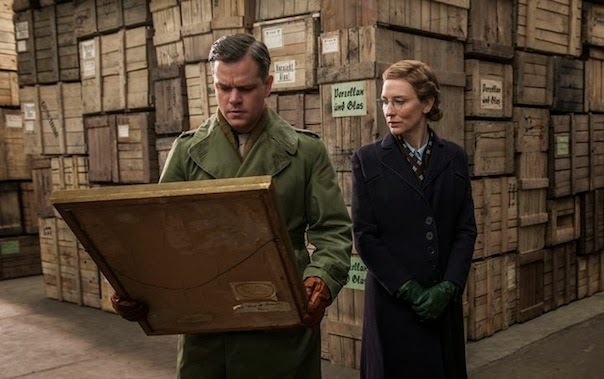 “The Monuments Men” sure doesn’t know. Definitely not. It's a good "Hey, this is on TNT" movie.